Winter is upon us; in all its glory and what I look forward to most is a delicious bowl of homemade soup. It is at its best next to the water in the freezing months – nothing heats you up from the inside like a thick, hot cuppa soup! I like to prepare my deliciously creamy, roasted butternut and biltong soup in advance (at home), and freeze it in freezable storage containers. When it is time to pack, I simply grab the soup from the freezer and pop it into our cooler box. It is great for those long trips, as your frozen soup will keep other food cold as well. When you’re hungry, simply heat it up over a fire or gas stove and it should be ready to eat in no time. Soup is a great treat for day sessions as well. Simply heat the soup and pour it into your flask – you’ll be sorted for lunch! Preheat the oven to 200°C. Add the butternut cubes to a baking tray and drizzle with the olive oil. Season with the salt and freshly ground black pepper, and bake for 45 minutes. Melt the butter in a pot over medium heat, add the onions and saute until translucent. Add the garlic and fry for another minute. Add the chicken stock and Worcestershire sauce, and bring to a boil. Reduce the heat and simmer for 5 minutes, and then remove from the heat. Add the cream and biltong sprinkles to the soup and simmer for 1 minute. 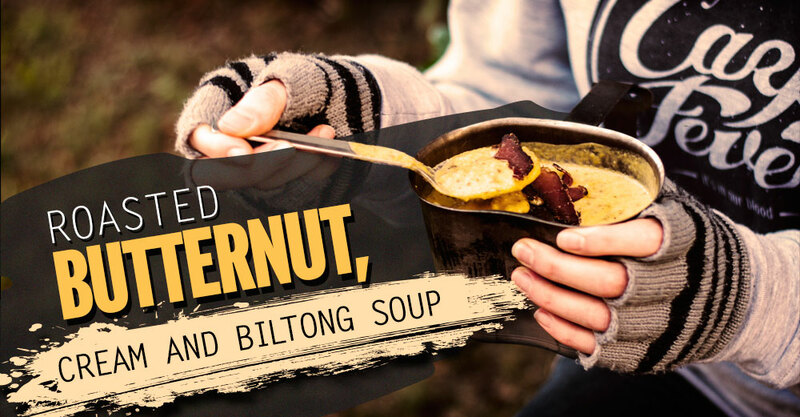 Serve with biltong slices and enjoy with a toasted campfire bun. For a variation on this recipe, ditch the biltong completely and add 7,5ml curry to your dish. If the soup’s consistency is too thick for your liking, simply add another 250ml of chicken stock or hot water.